Focal is France's leading hi-fi speaker manufacturer, and if the name isn't immediately familiar, that's because its complete loudspeaker systems were called JMLab up until 2004. Since then it has gone back to using the company's original name of Focal, which used to be reserved for its raw drive unit sales. 2006 saw the introduction of no fewer than ten new stereo pairs in its 'budget price' Chorus ranges - we use the plural here because they fall into two distinct groups: the simpler, less costly and more traditional looking 700Vs (the replacements to the original Choral range) and the more stylish, expensive and more substantial 800Vs (which effectively replace the earlier Cobalts). This £289 per pair Chorus 705V is the smallest and least expensive of the group of ten. It's also the smallest, but by no means the cheapest, in this test group. But it does incorporate a number of premium features by way of compensation. Focal is first and foremost a drive unit specialist, and makes the point that all the drivers it uses are made in its French factory. Also, the distinctive styling has tapering side panels, so the internal faces are not parallel and therefore avoid creating focused (frequency specific) standing waves. All the panels, finished in Amati vinyl woodprint, are a substantial 20-25mm thick. The small cone driver used here has a 135mm cast alloy frame and a 100mm diameter paper cone coated with 'Polyglass' glass 'micro-spheres'. The inverted dome tweeter is a familiar Focal feature, the example used here having an aluminium/magnesium alloy diaphragm, mounted in a rigid L-shaped cast chassis at the top edge of the enclosure, unobstructed by the visually rather striking V-shaped grille. A small front port provides bass loading, signal is applied to a single terminal pair, and a rear panel mounting lug is fitted to hang the speaker on a wall. 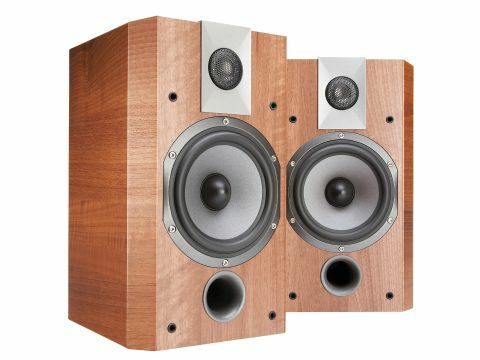 That rear panel mounting lug implies that the speaker is suited to close-to-wall siting, and that was amply confirmed by both in-room measurement and listening tests. Even with wall assistance, there's not a lot of bass weight or authority here, but the alignment is good, delivering a smooth bottom end with some agility and a welcome freedom from boom or thickening. The website suggests that the 705V is best suited to smallish rooms of 15 square metres or less - significantly smaller the 24 square metres of our listening room. A smaller room will tend to increase the mid-bass output, which will probably be beneficial here. Provided there are no inquisitive probing fingers around that might cause damage, it's sonically well worth removing the little magnetically-held metal mesh covers protecting the tweeter diaphragms. The tweeter is the star act in this speaker, and removing those obstructive covers does seem to add significantly to the overall delicacy, sweetness and transparency of the sound. Wall proximity usually involves some increase in midband coloration, but the 705V seemed less susceptible than most to this unwanted side-effect. A smooth and polished performer, this is a very polite-sounding speaker that delivers plenty of sweet detail with little to disturb its overall equanimity and neutrality. The down side, however, is rather weak and feckless dynamic expression, softening the impact and drama of the music, and somewhat reducing the facility of communication. While the recommendation for smaller room use makes good sense and will positively influence the overall balance of this speaker, it won't improve the lack of subjective dynamic vigour.